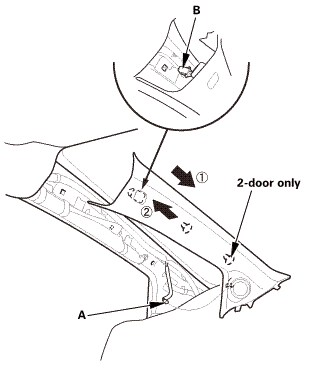 Pull out the A-pillar trim (A) to release the clips. 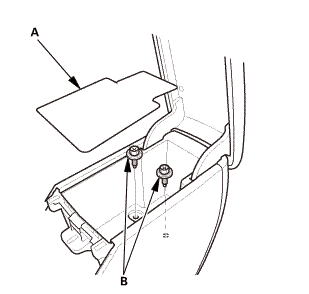 Put a shop towel (A) in the opening between the A-pillar trim (B) and the dashboard to prevent dropping the A-pillar clips. 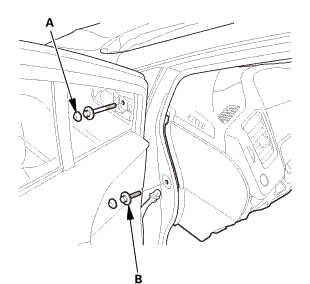 Disconnect the connector (A), then remove the A-pillar trim (B). 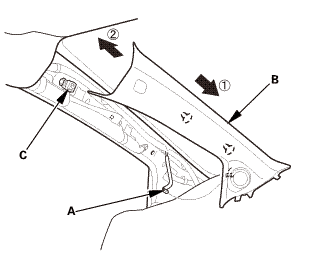 NOTE: The upper clip (C) will stay in the body. 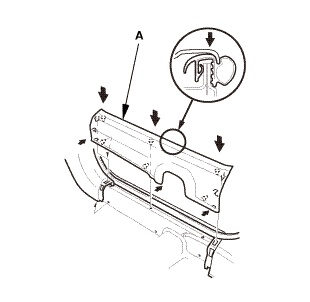 Remove the upper clip (A) from the body. Lower the glove box (A). 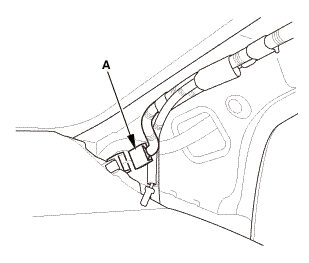 Remove the rear heater joint duct (A). 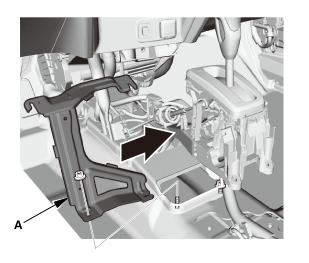 Remove the center console base bracket (A). 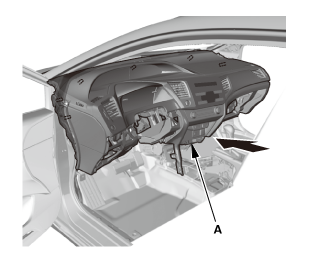 Remove the access panel (A). 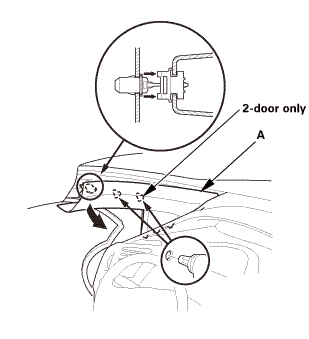 Disconnect the driver's airbag inflator connector (B) on the cable reel harness. 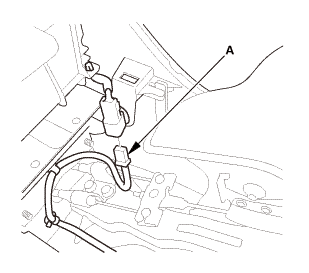 Disconnect the horn switch connector (C). 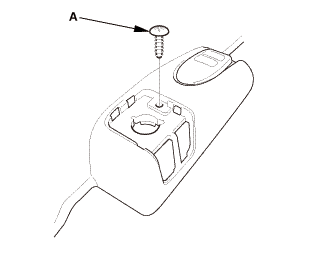 Remove the TORX bolts using a TORX T30 bit. 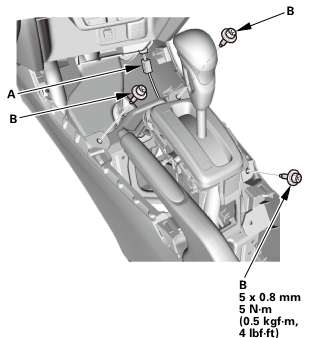 Remove the driver's airbag (A). Set the front wheels in the straight ahead position. Loosen the steering wheel bolt (B) three turns. 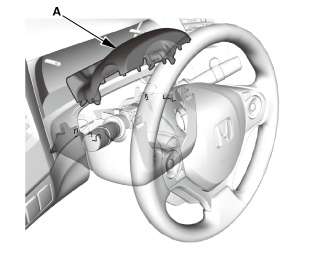 Install a commercially available steering wheel puller (A) on the steering wheel (B). 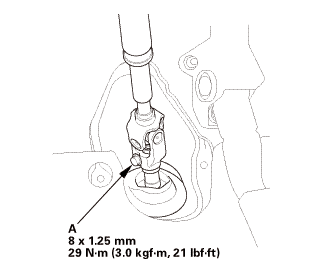 Free the steering wheel from the steering column shaft by turning the pressure bolt (C) of the puller. 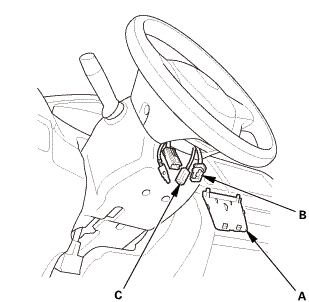 Remove the steering wheel puller. 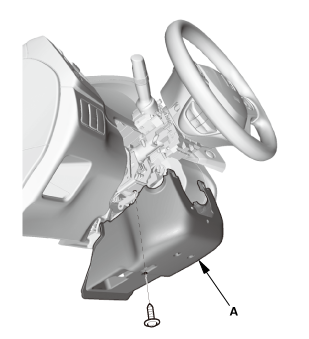 Remove the steering wheel (A) from the steering column. 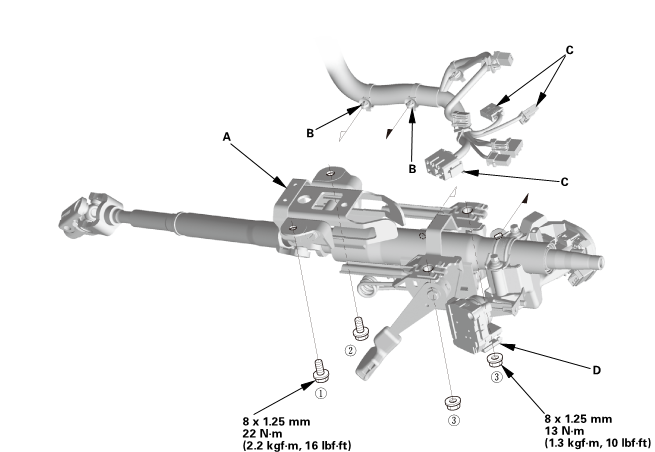 Remove the upper column cover (A). 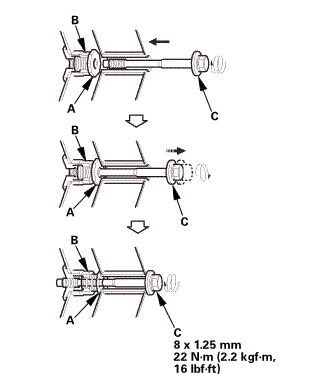 Remove the lower column cover (A). 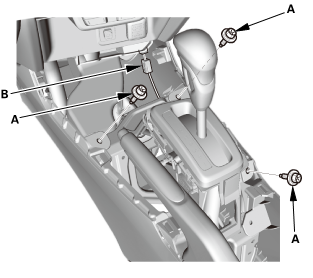 Remove the combination switch body assembly (A) from the steering column shaft. 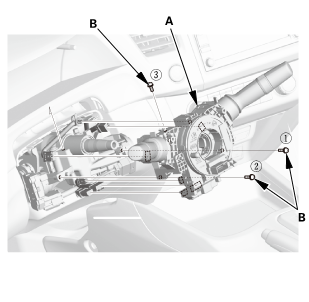 Set the steering column to the center tilt position, and to the center telescopic position. 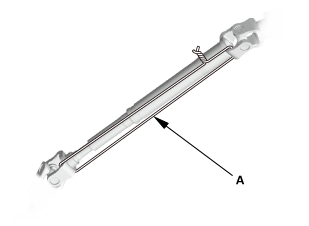 Hold the lower slide shaft (A) on the column with a piece of wire (B) between the joint yoke (C) of the lower slide shaft and the joint yoke (D) of the upper shaft to prevent the lower slider shaft from pulling out. 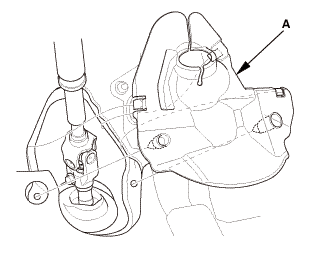 Loosen the steering joint bolt (A). 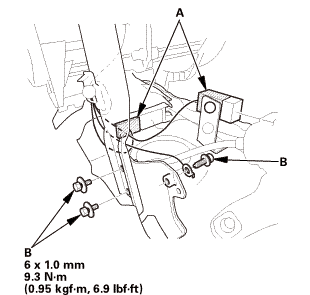 Remove the steering joint bolt (A). 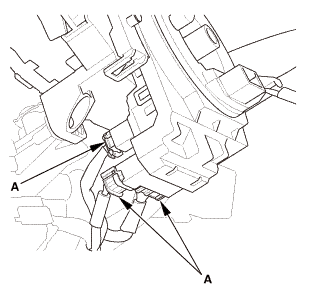 Disconnect the steering joint (B) from the pinion shaft. 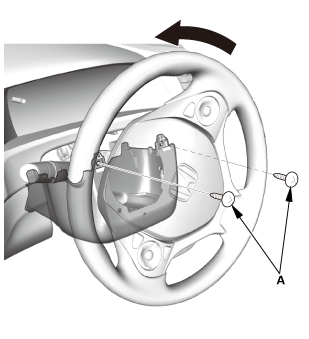 If the center guide (C) is in place and has not moved, leave it in place. 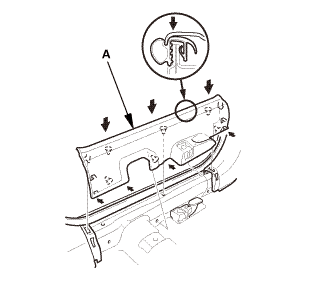 If the center guide has come off, discard it. 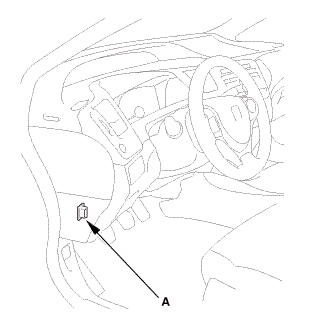 With steering lock: Disconnect the connectors (A) from the ignition switch (B). 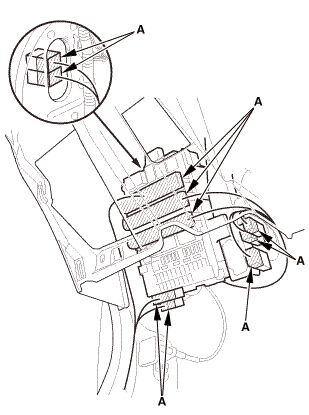 Detach the wire harness clips (C) from the steering column. 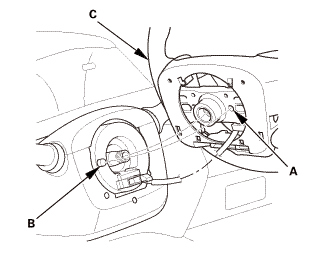 Remove the steering column (D). 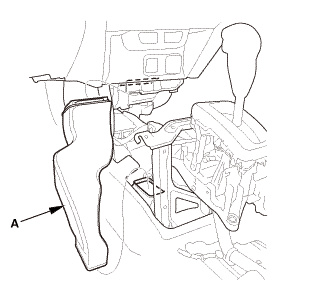 NOTE: Do not release the lock lever until the steering column is installed. 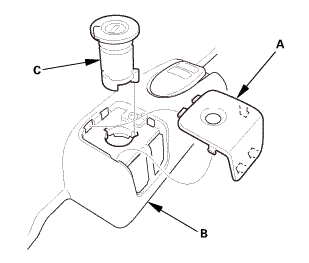 If the lock lever is released before installation, adjust the steering column after installation. 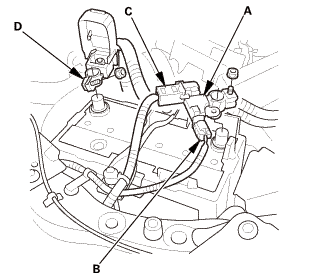 Remove the injector control module (A). 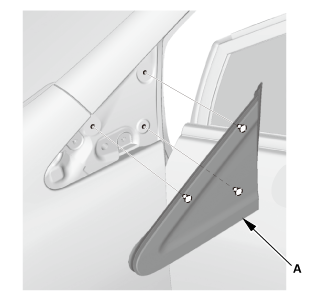 Remove both A-pillar corner trims (A). 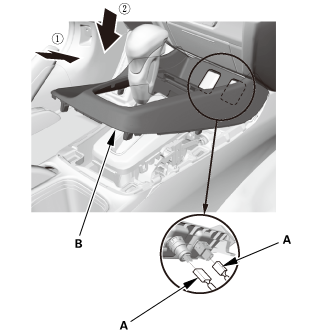 Remove the bolts (A, B) from under the dash. 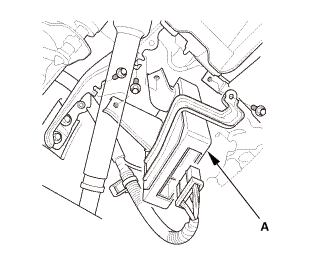 With climate control: Remove the aspirator hose (A). 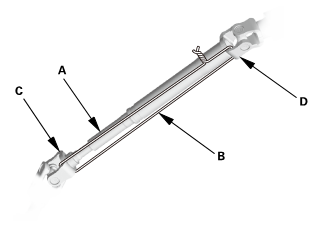 Loosen the special bolts (B) until they disengage from the threads on the hanger beam side brackets (C), and engage the inside threads of the collar bolts (D). 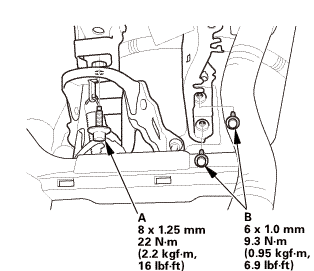 The thread lock on the special bolts makes the special bolts and the collar bolts turn together. 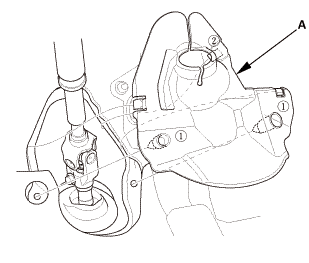 Continue to loosen the special bolts to turn the collar bolts into the fixed space adjusters (E) until the collar bolts engage the adjuster brackets. This creates a gap (F) between the collar bolts and the body. 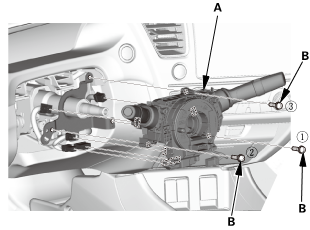 Check that the collar bolts (A) are seated in the fixed space adjusters (B). 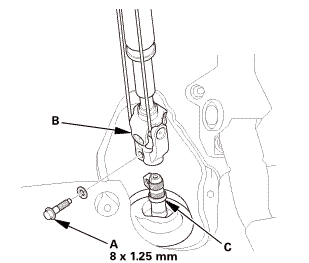 NOTE: If either collar bolt was not seated, replace the special bolts. 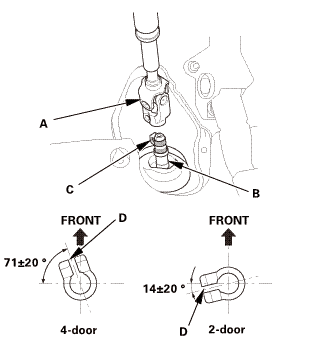 Make sure the collar bolts (A) turn easily by hand in the fixed space adjusters (B). Tighten the collar bolts by hand until they engage the fixed space adjusters before reinstalling the dashboard. 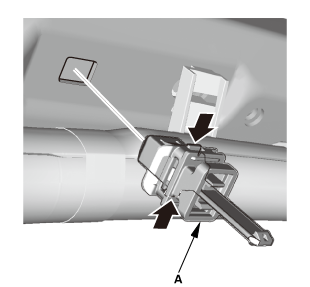 Before reinstalling the dashboard, screw the special bolts (C) into the collar bolts, and check that they turn together. 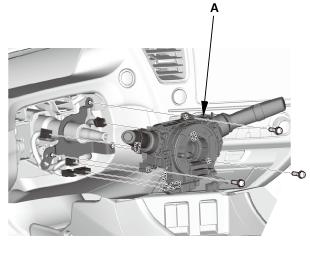 If they do not turn together, replace the special bolts. 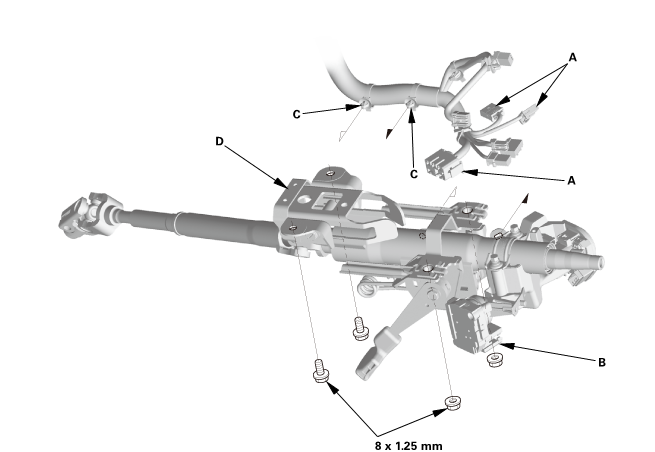 Install the special bolts (A). 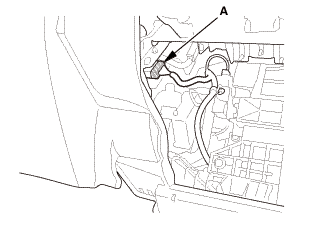 With climate control: Install the aspirator hose (A). 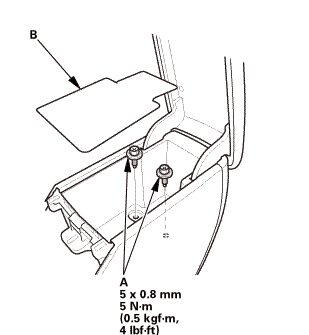 Install the bolts (A, B) under the dash. 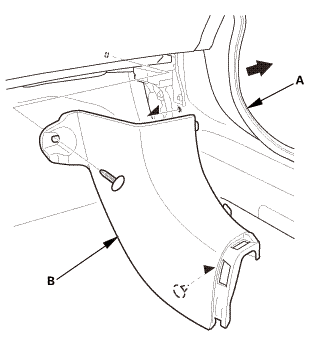 Install both A-pillar corner trims (A). 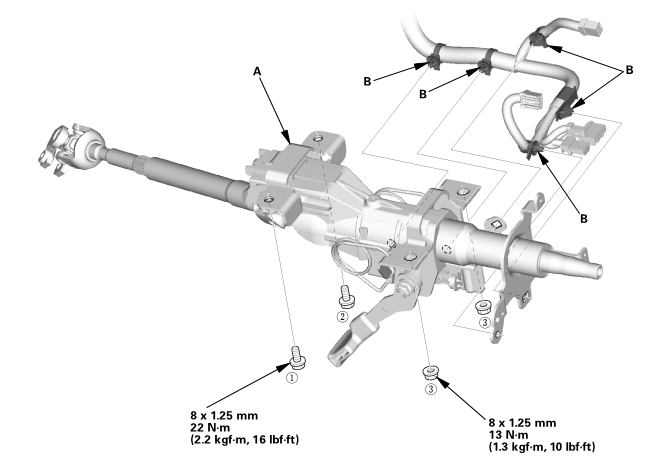 Install the injector control module (A). 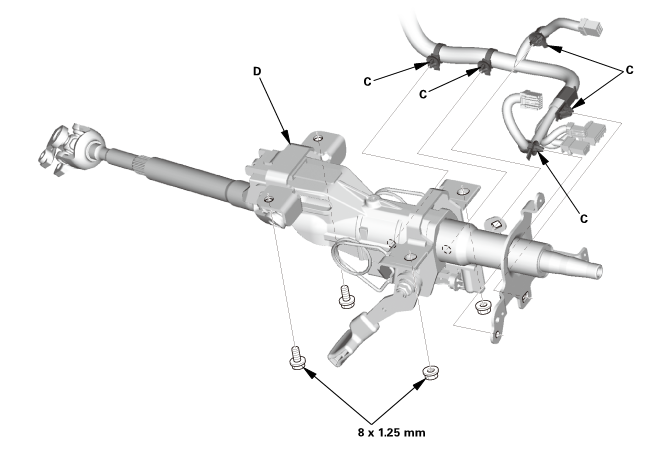 Install the steering column (A). Loosely tighten the attaching nuts and bolts. 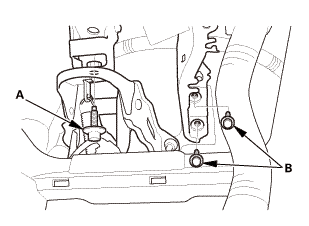 Tighten the attaching nuts and bolts to the specified torque in the sequence shown. 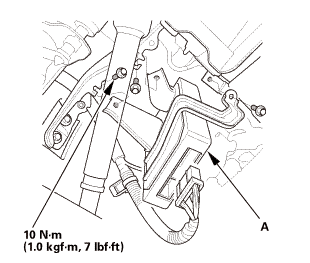 Install the wire harness clips (B) to the steering column. 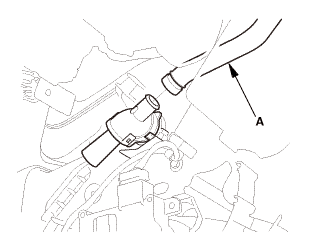 With steering lock: Connect the connectors (C) to the ignition switch (D). 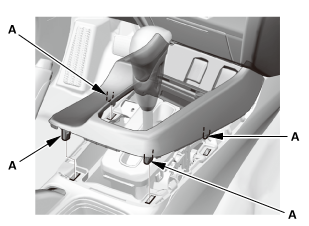 Set the rack in the straight ahead driving position. 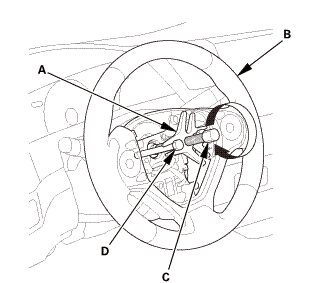 Slip the lower end of the steering joint (A) onto the pinion shaft (B). 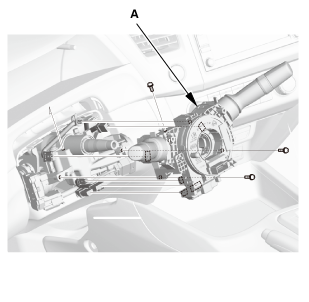 Pinion shaft with center guide: Install the steering joint by aligning the center guide (C). 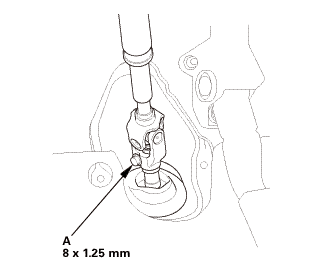 Pinion shaft without center guide: Position the steering column by aligning the gap (D) within the angle. 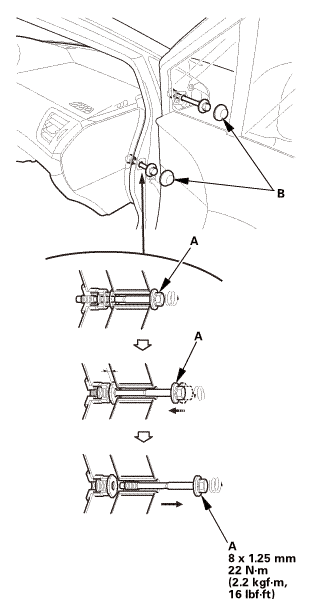 Align the bolt hole (A) on the steering joint with the groove (B) around the pinion shaft. 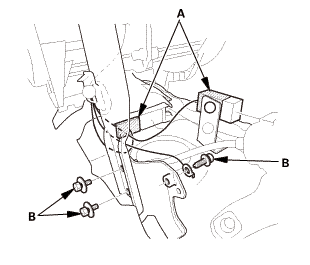 Loosely install the steering joint bolt (C). Be sure that the joint bolt is securely in the groove in the pinion shaft. 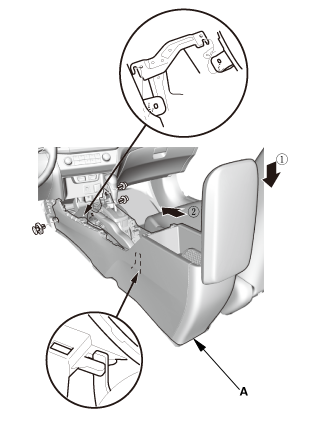 Pull on the steering joint to make sure that the steering joint is fully seated. 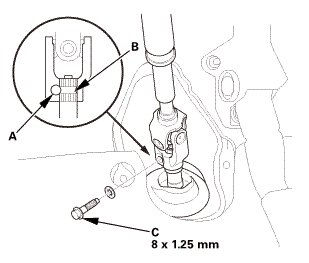 Tighten the steering joint bolt (A) to the specified torque. Install the combination switch body assembly (A). Tighten three screws (B) in the sequence shown. 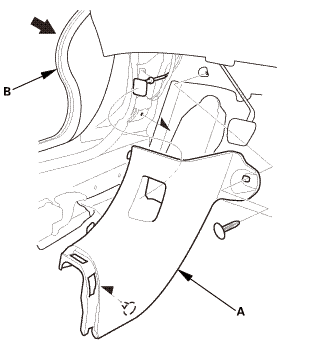 Install the lower column cover (A). Install the upper column cover (A). Make sure the front wheels are pointing straight ahead. Center the cable reel (A). Do this by first rotating the cable reel clockwise until it stops. 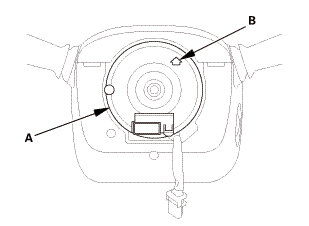 Rotate the cable reel counterclockwise about three full turns. The arrow mark (B) on the cable reel label should point straight up. 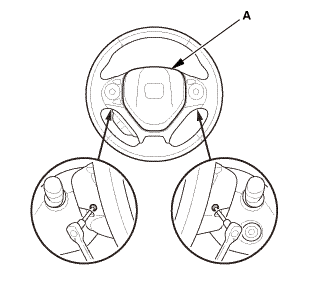 Position the steering wheel hub (A) so that it engages the pin (B) of the cable reel. 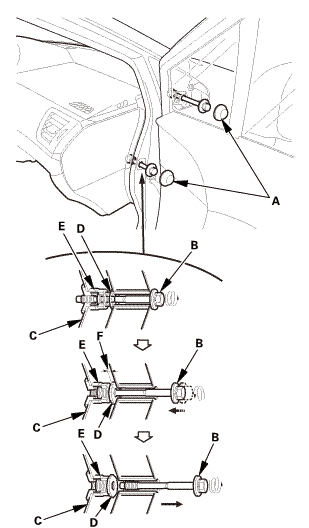 Install the steering wheel (C) on to the steering column shaft. 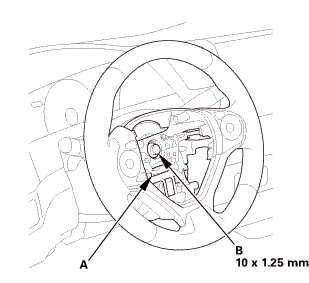 NOTE: Do not tap on the steering wheel or the steering column shaft when installing the steering wheel. 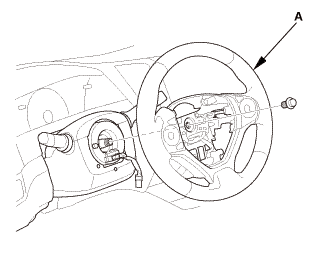 Install the steering wheel bolt (A), and tighten it to the specified torque. 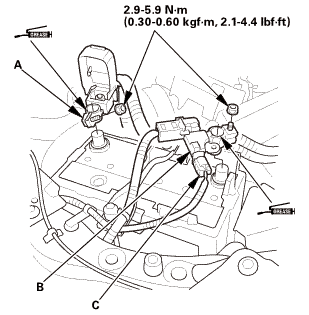 Make sure the wire harness is routed and fastened properly. 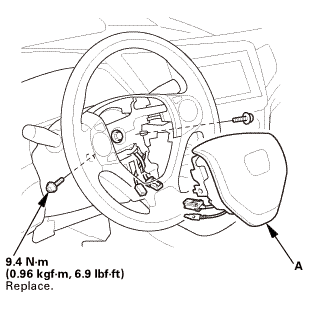 NOTE: If you are replacing a deployed driver's airbag, inspect the cable reel for heat damage. If there is any damage, replace the cable reel. 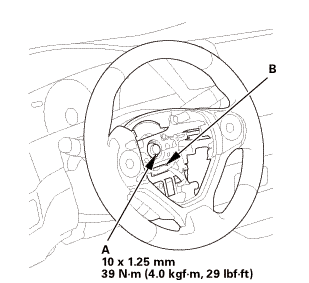 Place the driver's airbag (A) in the steering wheel. 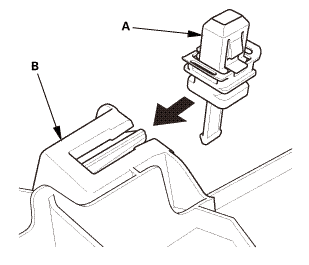 Tighten the new TORX bolts using a TORX T30 bit. 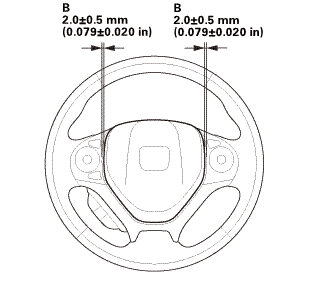 NOTE: Make sure the clearance (B) between the steering wheel and horn pad is the specified value. 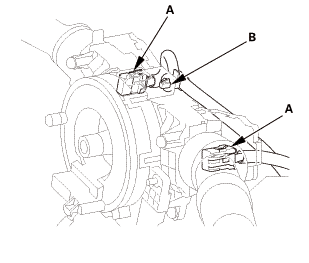 Connect the driver's airbag inflator connector (A) on the cable reel harness. Connect the horn switch connector (B). NOTE: After reconnecting the negative cable to the battery, make sure the horn works properly. Install the access panel (C). 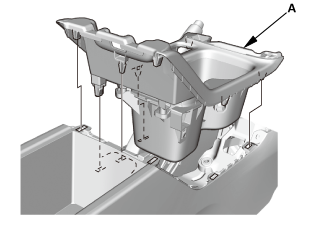 Install the center console base bracket (A). 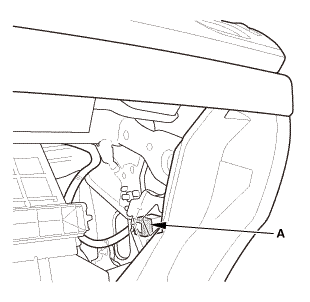 Install the rear heater joint duct (A). 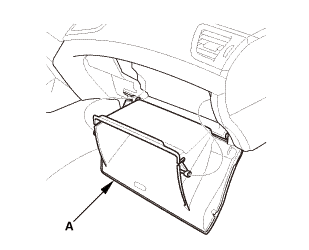 Install the glove box (A). 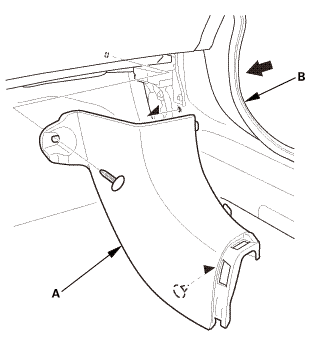 Carefully install the new upper clip (A) to the A-pillar trim (B). Fit the clips into the holes in the A-pillar. 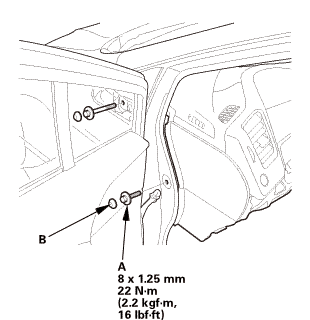 Lightly push the A-pillar trim (B) into place, then install the trim. 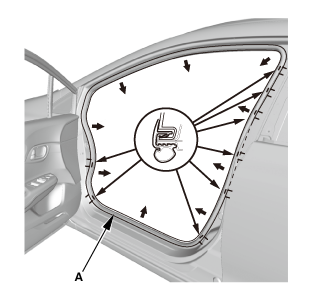 Make sure the side curtain airbag is not tucked under the clips or the trim ribs. 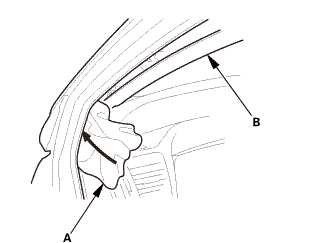 Do not push too hard on the A-pillar trim. If you push too hard, the clip will be damaged, and it will not hold the trim properly. 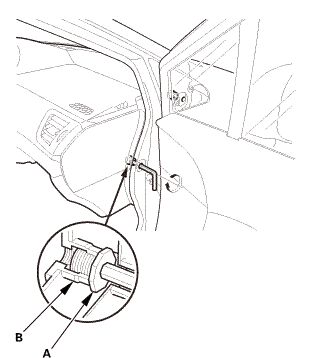 Gently tug on the A-pillar trim to verify that all clips are securely fastened. Park the vehicle on a flat and level surface, with the steering wheel in the straight ahead position. Select VSA ADJUSTMENT, then select ALL SENSORS with the HDS, and follow the screen prompts. NOTE: See the HDS Help menu for specific instructions. 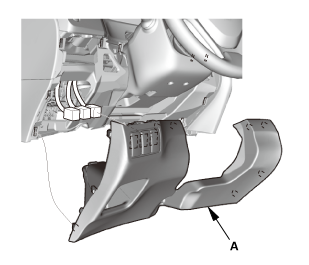 Select EPS ADJUSTMENT, then select EPS STEERING ANGLE SENSOR VALUE CLEAR and follow the screen prompts on the HDS.